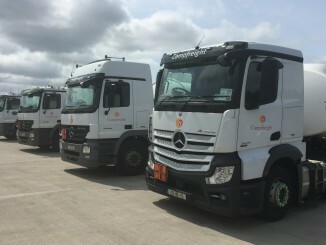 Campfreight in New Ross, Republic of Ireland chose the EA Projects terminal automation platform to control their road tanker loading facility which was commissioned in July this year. The site is equipped with a 5 arm bottom loading skid providing a number of different product grades. All loads are controlled by the iSupervisor tanker loading package and the tanks are monitored by the iMonitor tank gauging system. The loading skid supplied by Industrial Flow Control is fitted with a Metermatic MPC flow computerwhich is controlled by the host iSupervisor terminal automation system. This level of control means that the system is able to provide a complete audit trail of all delivery volumes in both Natural and Standard Litres which was an important requirement for the customer. There are number of third parties who will be loading from the facility and the automation platform allows individual load plans to be set up for each company loading at the facility. The system records stock receipts from each company, and tracks the allocation of this company stock by vehicle and driver. The fully integrated reporting package then provides a number of reports for the third parties which can be produced over any given date range. A number of these reports have been customised to meet Canmpfreight requirements. The tank farm is also fitted with the Hectronic Optilevel tank gauging system providing measurement of +/- 1mm accuracy and temperature and water volume measurement. The system automatically calculates the stock loss gains for each product in both natural and temperature compensated volumes as a standard feature of the system. The iMonitor package also supplies full trending histories for audit purposes and allows the customer to record all product receipts at the depot.